Before modern conveniences such as electricity in homes and what-all, most people had to get their water from hand-pumps in the kitchen or outdoors. During dry spells they had to haul water to keep their vegetables and flowers from wilting. 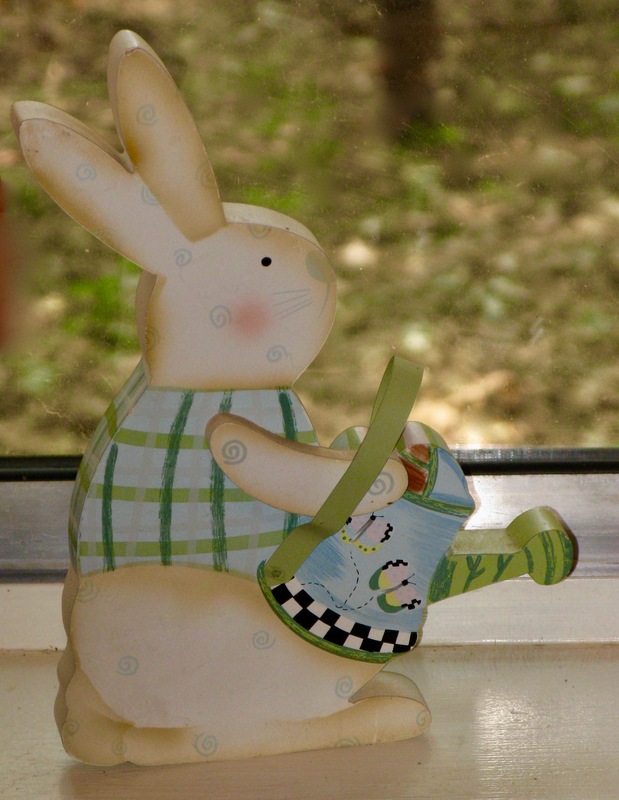 So it was that Petra Rabbit one hot summer day was carefully carrying her watering can to the garden of which she was so proud. And who should she spot but old Mr. McGregor, who lived next door. He’d moved into the hut next to her property years before and mostly kept to himself. Was almost a hermit. He’d stride through the neighborhood wearing a cloak of rough cloth at all hours and barely speak to anyone. When she spotted him that summer day, Petra, out of kindness, invited Mr. McGregor over for lunch. He wolfed down the meal with such gusto she got the sense he sometimes went hungry. During his visit, she noticed Mr. GcGregor examining her garden with great interest, and, at first, was proud that it’s long, straight rows of vegetables presented such an inviting appearance. But starting a week or so later, she saw that almost every day one or two of her plants had been disturbed and some of the corn, or beets, or squash, picked off and taken away. She thought it might be animals sneaking into her garden, although she kept a careful watch. But then while out for an evening stroll she caught sight of Mr. McGregor, basket in hand, tiptoeing from her garden toward his nearby hut. An hour later, the scent of vegetable soup came wafting her way. Her whiskers twitched with annoyance, but she also felt sorry for the elderly man in his crude hut – while she lived in a lovely little home and went to bed well-fed every night. So while she sometimes thought of getting out Pa’s old shotgun and sending some buckshot Mr. McGregor’s way, she finally decided to just let things be. And after awhile she knocked on the door of his hut and invited him to just help himself whenever he needed any strawberries, or green beans, or potatoes. He was so moved he couldn’t stop a few tears from running down his cheeks. From then on he didn’t have to sneak over for food. He’d stroll into the garden on sunny afternoons and pick up whatever struck his fancy, offering a friendly hello to his neighbor if she was out and about. It wasn’t long before he picked up shovel and hoe and started doing some of the hard work in Petra’s garden. She greatly appreciated the help, as her arthritis often flared up after an afternoon of toiling in the vegetable beds. So it turned out happily for everyone, and soon Mr. McGregor was looking healthy and hearty, and became a favorite of the children along the street. He’d repair their toys and read them stories whenever they asked. Their favorite story was The Tale of Peter Rabbit. Tags: Peter Rabbit, rabbit. Bookmark the permalink.